Maurice A. 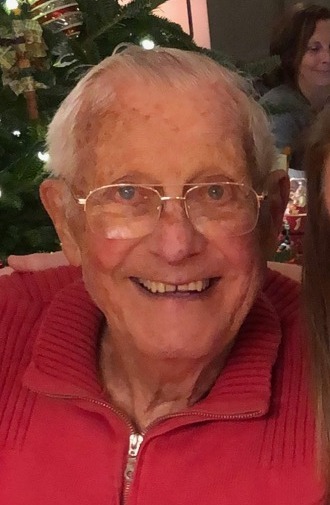 “Maury” Brockman, age 88 of Darboy, passed away peacefully surrounded by his loving family on Saturday, February 2, 2019. He was born on June 7, 1930, son of the late Joseph and Minnie (Lamers) Brockman. On October 13, 1953, Maury married Marilyn Betters at Holy Name Catholic Church in Kimberly. After Marilyn passed away at age 53, Maury married Ethel Rooyakkers at Holy Angels Catholic Church in Darboy on May 25, 1990. Maury was a plastering contractor for most of his adult life. He owned and operated Brockman and Sons Plastering. After retirement Maury worked for the Darboy Sanitary District for years. He passed on his skills and his strong work ethic to his children and grandchildren. In his free time, Maury loved spending time up at his cottage on Berry Lake. You could usually find him planting flowers or tending to his tomato plants. He would grow and share hundreds of tomato plants each year. In his earlier years, Maury proudly served his country in the United States Army and was a member of the Town of Buchanan Fire Department for many years. Maury is survived by his children: Jeff (Pat) Brockman, Little Chute; Jon (Julie) Brockman, Little Chute; Jean (Kim) Hetherington, Appleton; and Julie (Mike) Peerenboom, Little Chute; grandchildren and great grandchildren: Amy (Dave) Verstegen and their children: Kara, Tyler and Brett; Tom (Angie) Brockman and their children: Lily, Ella and Ryan; Jenny (Kurt) Peeters and their children: Delaney, Luella and Marlena; Sara (Pete) Litersky and their children: Max, Morgan and Chase; Matt (Kayla) Brockman and their children: Sam, Jack, Anna and James; Luke (Holly) Brockman and their children: Isaac and Shea; Craig (Corey) Hetherington and their children: Ryder and Rayne; Laura (Dave) McGuire and their children: Aubrey, Henry and Grace; Paige Peerenboom and Chet Peerenboom (special friend, Julie Plonsky); his wife, Ethel; a step daughter, Ellen (Tom) Walsh and their children: Bill and Jack Walsh; Brother and sisters-in-law: Pat Betters, Marie Brockman, Louise Albrecht, Mark (Lorrita) Gorman and Irene Lowny; many nieces, nephews, other relatives and many friends. Maury was proceeded in death by his first wife, Marilyn; brothers: Lester, Lawrence (Ethel), Jerome, Vilas (Germaine) and Gordon (Pat) Brockman; Marilyn’s siblings: Rose (Wayne) Hunter, Evelyn (Adrian) VanderZanden, Emil (Shirley) Betters, Jess Betters, Howard (Phyllis Betters) and Arthur (Bernice) Betters; brother-in-law: Warren Lowny and step children: Steve and Ann Rooyakkers. Funeral services will be held at 5:00 p.m. on Thursday, February 7, 2019, at ST. JOHN NEPOMUCENE CATHOLIC CHURCH, 323 S. Pine Street, Little Chute, with Maury’s good friend Fr. Willie Vande Loo officiating. Visitation will be at the church on Thursday from 2:00 p.m. until 4:45 p.m. Interment will be in Holy Name Cemetery, Kimberly. In lieu of flowers, a memorial is being established in his name. For online condolences, please visit www.verkuilenfh.com. The Brockman family would like to extend a special thank you to the staff of the St. Paul Villa and Theda Clark’s 6th floor for your wonderful care and compassion.